Hello all! 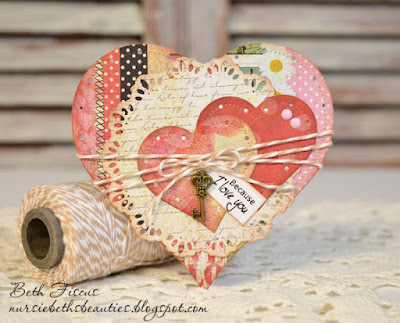 I am sharing a shaped heart card with you today. I started out by making the card base using the largest GMD Big and Little Pierced Chain Heart die. I layered that with a GMD Lacey Doily die cut and two die cuts of the smallest GMD Big and Little Pierced Chain Heart die. I wrapped Krazy For Kraft Trendy Twine around the front, added a small sentiment on a tag and a key charm. The finishing touch was two GMD Rose Garden Enamel Dots on the small heart. 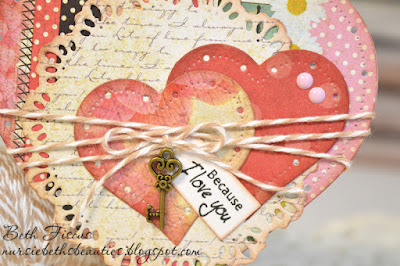 The papers I used are from the 6x6" Love You pad from The Paper Studio. Super fun shaped card! The papers are so gorgeous and the twine looks perfect! BEAUTIFUL card Beth! I LOVE the shape & pretty papers... really vintage/chic.. LOVE it!